Year 11 pupils from Amble’s James Calvert Spence College (JCSC) this morning received their GCSE results in the first phase of the new numerical grading system. Grades 9, 8 and 7 are roughly equivalent to an A* and A with a grade 9 being harder to achieve than an A*. Grades 6, 5 and 4 are in roughly equivalent to grades B to C.
A 3 would roughly be similar to a D grade with 2 and 1 grades taking the place of E, F and G. The U (ungraded) mark remains. More information on the new grading system can be found here. Two JCSC pupils celebrated their success from achieving the harder-to-achive grade 9. 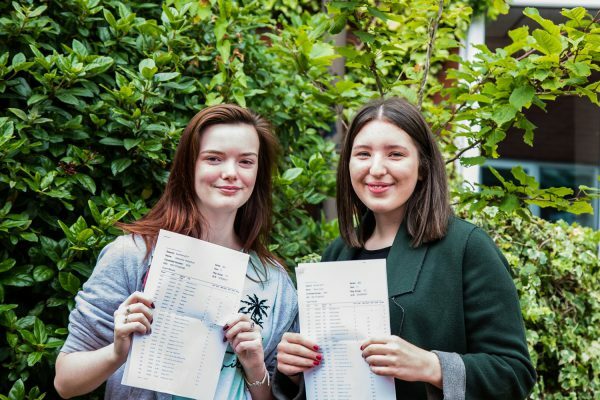 Charlotte Patterson (pictured above) said she was “really excited” and “couldn’t believe it” after achieving the grade 9 in English Literature along with an 8 in Maths, a 7 in English Language, an A* in Chemistry, Biology, Physics and Geography. “I’m in awe, I just can’t believe it, I was really nervous but just so relieved” Charlotte added. She goes on to study Maths, Chemistry and Biology in Sixth Form at JCSC next year. The second to achieve the higher number 9 grade was Ryan Jones (pictured above) who received the grade 9 in Maths. Ryan said “I just want to thank my teachers for helping us through the course because it’s been a tough year with the new specification, everyone’s came out well. I was feeling very nervous this morning but it’s turned out okay, well, better than okay”. 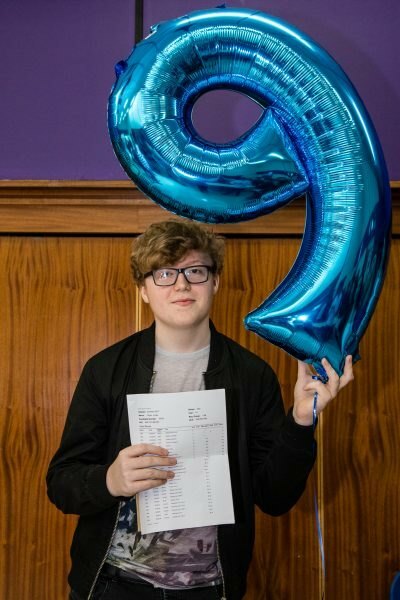 Ryan achieved 4x A* grades in Physics, Chemistry, Biology and Computer Science. “I was ecstatic, I can’t even believe it, I thought I was going to get a 7” he added. Ryan goes on to study Maths, Physics and Chemistry in Sixth Form at JCSC next year. 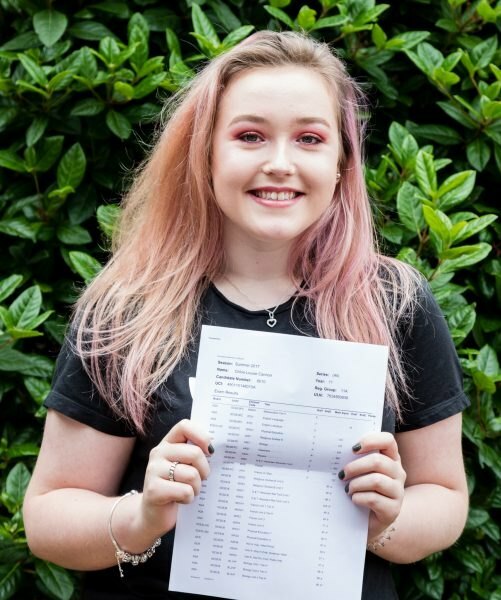 Chloe Cannon (pictured below) said she was feeling very nervous coming into school this morning to collect her results but she was pleased she did well in most things. Chloe achieved 2x A*’s in Chemistry and Physics, 4x A grades in Religious Studies, Biology, French and DT and a high 8 grade in Maths. “I feel very relieved and excited to get onto the courses I want to do”. She will go on to study Chemistry, Physics and Maths in JCSC’s Sixth Form. Robyn Scott and Alex Rutherford (both pictured below) were all smiles and relieved once they’d learned their results. Robyn said she was “buzzing that she passed” after achieving a 5 in English Language, a 6 in English Literature and a B grade for her other subjects. She described herself as feeling nervous to come this morning. “Out of all of them I thought maths I was definitely going to fail but I’m so relieved I passed”. 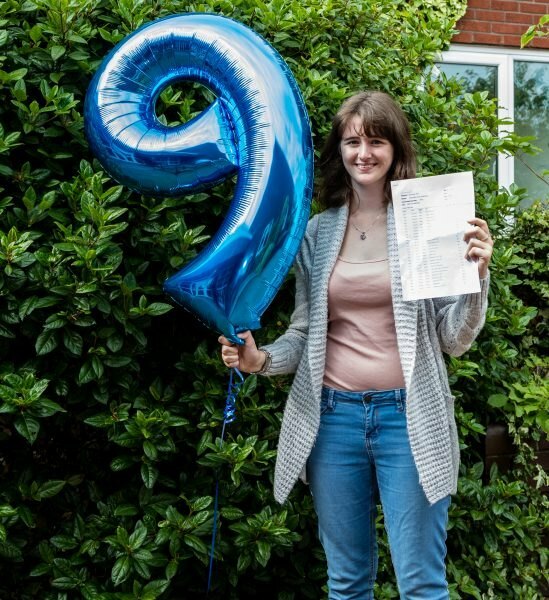 Alex said she felt “amazing” after achieving an A in English Literature and Biology, B’s in Chemistry, Physics, Geography, History and Religious Studies. I’m definitely relaxed, I’m just so happy I passed Maths”. Alex said she felt “really nervous” and was making up scenarios in her head before she arrived this morning. Both girls are staying on in Sixth Form at JCSC, Robyn was currently unsure which subjects she wants to take but thinks she’s going to study Geography, French and IT. Alex is hoping to study Physics, Biology and Geography in Sixth Form next year. 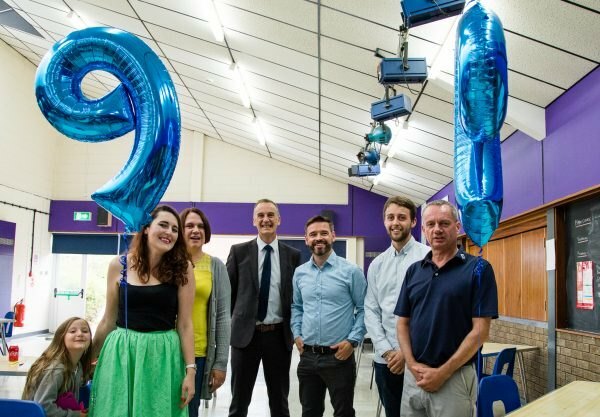 With new-style GCSEs in maths and English issued today, James Calvert Spence College is delighted to report further improvements in overall Key Stage Four performance. There has been a ten percentage point improvement in those achieving five good GCSEs including English and maths compared to figures in 2016. Those achieving good Ebacc qualifications has risen by twelve percentage points over the same period. Jasmine Tyson (three A* and three A grades). We are immensely proud of Katie Wilson and Cain Douglas who made spectacular progress from Key Stage Two to Key Stage Four. The school’s progress figures overall remain pleasing. We would like to congratulate our students for their hard work and thank their parents for their support over the years. We are also most indebted to our dedicated and hard-working staff. A great day all round for our students, the school and the Amble community.